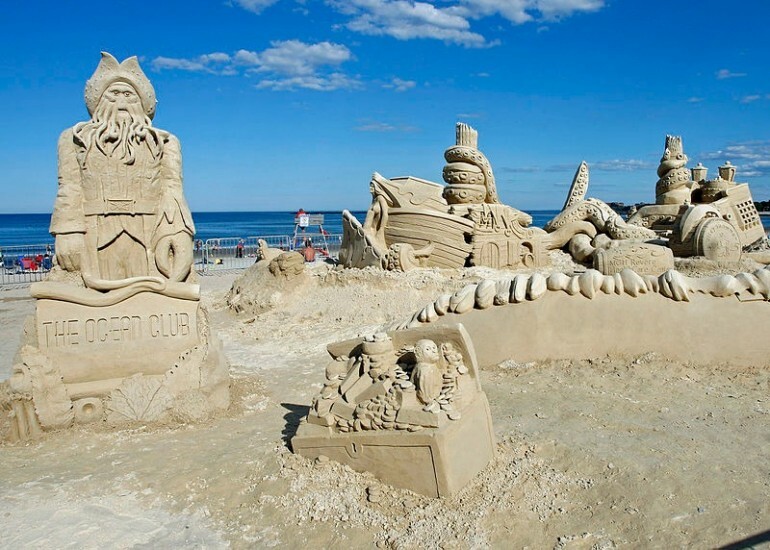 From traditional sand castles that children created on the beach, the art of shaping sand has taken off and started the trend of sand sculpture. It grew from the old shape of an unturned beach pail with a small flag on top, to some semblances of castle fortifications and castle turrets surrounded by a moat. Today, several artists have discovered another medium to express their creativity – sand sculptures – created during sand festivals in different parts of the world, some of them getting used for promotions and advertising. During sand festivals, expect to see grandiose works of art, which you typically see created in stone, wood or bronze. Sand sculpture, as an art form uses sand as the medium instead of traditional sculpture materials such as clay, wood, marble or metals. The only raw materials needed are water and sand – plenty of it. It is mostly done on the beach although recently there are some events where the sand sculptures are done in specially-marked areas where the raw medium is imported. 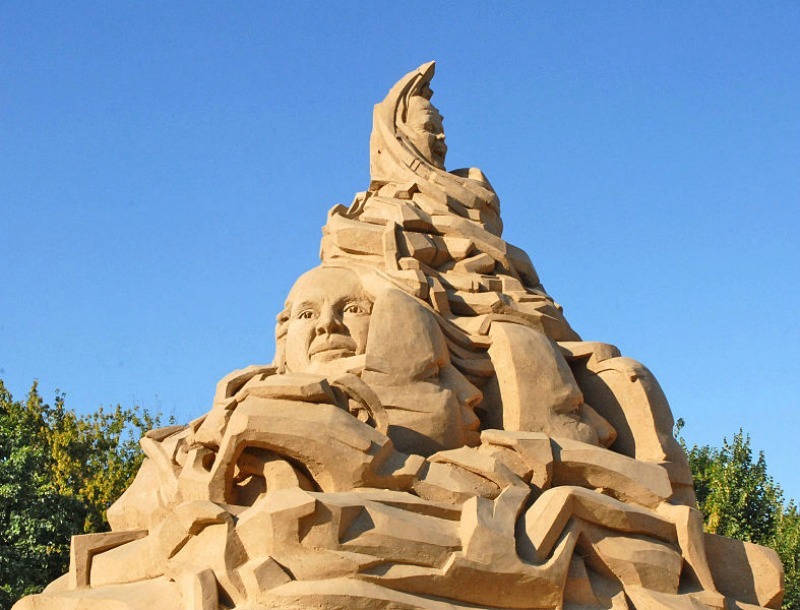 From being a summertime hobby, sand sculpture has now attracted numerous artists and helped launch the career of many. While the main materials for sand sculpture are just water and sand, it is by no means a simple task. There has to be a right mix of water and sand to make the raw materials hold their shape. The sand used in sand sculpting is special. It is not the ordinary beach sand whose grains are smoother and therefore will not have the tendency to stick together. What is used for sand sculpture is called dirty sand or heavy sand, the sand that is used as building material for homes and buildings which has square grains. Water is used to create a hard pack. Water forms the little bridges among the sand grains, creating surface tension. Creating a huge sand sculpture needs several tons of sand. A 10-meter high sculpture can take more than two months to build. It requires a lot of endurance and patience from the sculptors, outside of his creative skills. Preparation is the most important part of creating sand sculpture. In the artist’s parlance, it is called pound up. This means building a two-foot tall retaining square or rectangle wooden wall or form, which will later be filled with sand up to the brim. The right amount of water is then added to the sand and then pounded down to create a very dense and firm base that will set hard as it dries. Later, several forms will be added one at a time, each one pounded down firmly. The initial shape of the sculpture will look like a pyramid of boxes. This first stage in the building process is very crucial because the whole sculpture and the shape that will evolve and take shape will depend on the proper packing of the sand. The sculpture will collapse if the pounding is not done properly. This process alone can take several weeks. Once the last-placed wooden form is removed (at the very top), then the sculptor begins the slow carving process from the top. Professional sand sculptors use a variety of tools, some of them used in the garden and the kitchen such as garden shovel, heavy duty work gloves, a crowbar for the forms, levelling tool, trowel, water spray bottle, kitchen spatula, cake-icing spreader, painting and palette knives, teaspoon or melon baller, paintbrushes, including a barber’s brush, surgical tubing, balloon pump and garden rake. Like the talented traditional sculptors, sand sculpture had caused the emergence of many talented artists, both individuals and groups from different parts of the world who have won sand sculpting championships. Some of these talents include Dan Belcher, KingSand (group), Team Sandtastic, Helena Bangert, Michel Lepire, and more. Radovan Zivny had created near-perfect replicas of Moses and Pieta by Michelangelo. Alas, sand sculpture is a work of art that you cannot buy and keep, although it can be used for advertising and promotions. Most of them cannot be displayed in art galleries. It is a fleeting form of art that can only be preserved in photographs.